One of the first items on your home maintenance schedule should be changing your home’s HVAC filters so that you know you’re starting off with nice clean filters. Mark the date on your calendar or set a reminder on your Smartphone to schedule regular replacement. Another common home maintenance item is a slow sink drain. This video will provide some helpful tips on removing the clog and cleaning out the sink’s trap. Here are some basic tools we recommend all homeowners put inside their toolbox. Always be prepared for any little maintenance or repair job the pops up in your new home. You can also click the link to our tool and maintenance item recommendations on Amazon below. 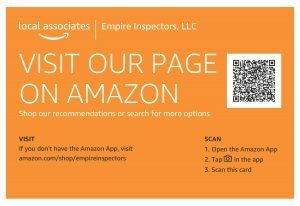 Having your home inspected by Empire Inspectors has an added benefit of purchasing a premium 18 Month Home warranty with No Pre-existing Conditions for the same price as a standard 12 Month warranty. Many of the items covered in this plan simply cannot be found in any other home warranty program. Click the banner below to find out more!